Bishop Nicholas Hudson: TLC needed after evangelisation conference from Catholic Church (England/Wales) on Vimeo. Bishop Nicholas Hudson, Bishop for the national Catholic evangelisation conference Proclaim '15, offers a few next steps after the once-in-a-generation event. Using the acronym T-L-C, Bishop Hudson says Proclaim '15 will leave a lasting legacy. Cardinal Vincent Nichols inspires over 800 evangelisers at Proclaim '15 from Catholic Church (England/Wales) on Vimeo. 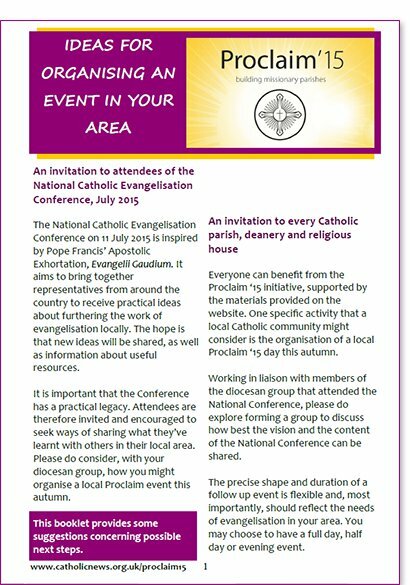 Archbishop Longley welcomes delegates to the national evangelisation event Proclaim '15 from Catholic Church (England/Wales) on Vimeo. Proclaim '15 conference host bishop, Archbishop Bernard Longley, welcomed delegates to the major evangelisation event in Birmingham on Saturday 11 July, and urged them to help a Western world that has become "unused to the sound of God's voice calling us to repentance and renewal". Alpha's Nicky Gumbel speaks at major Catholic evangelisation conference Proclaim '15 (SIGNED) from Catholic Church (England/Wales) on Vimeo. Rev Nicky Gumbel is vicar of Holy Trinity Brompton in London and the pioneer of Alpha, a 15-session introduction to the Christian faith now running all over the world. Nicky was interviewed by David Wells at Proclaim '15 held at the Birmingham Repertory Theatre on Saturday 11 July 2015.